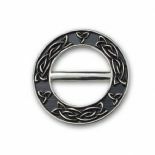 A great collection of Stainless Steel Scarf Rings, featuring celtic, thistle and Mackintosh inspired designs. We strive to provide our customers with the best possible standards of customer service, and want you to be absolutely delighted with your purchases from us. If for any reason you are not satisfied, simply return the items to us and we will gladly replace them or refund your money.